Let’s start with Nori seaweed sheets. These are a great alternative to tortillas if you are making something like a wrap or burrito. They come in different sizes, some are small and some are bigger (great for bigger burritos/wraps). What I like is that they’re low in calories, high in vitamins and minerals (such as Vitamin B/potassium/iron) and overall are much better than things with lower nutrient value like white flour tortillas. Now Seaweed sheets do have a distinct flavor which is much different than tortillas. They might take a little getting used to. 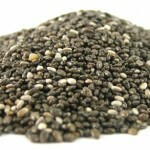 Next are Chia seeds from South America. These are great in cereals, on salads, or sprinkled in soup…you can even drink them in water. They are high in fiber/ Omega 3s, and gram for gram they contain: 8x more Omega 3 than salmon, 5x more calcium than 2% milk, 2x more fiber than bran flakes and 2x more iron than raw spinach. Isn’t that incredible! The high fiber will help satisfy your cravings and so will the Omega 3s, which stabilize your blood sugar so you don’t crave unhealthy foods. 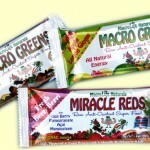 I don’t eat bars very often but here’s one that I do recommend from Macro greens/Miracle reds company (I interviewed them here). These bars are raw, organic, and vegan and the main ingredients are Brazil nuts, macro green and red powers, with a bit of date paste to bind it all together. They are high in antioxidants and minerals. I don’t eat these all the time, but once in a while when you’re in a hurry this is a great on the go snack. Larabar also has some newer bars made with chocolate (which I’m not happy about because it has a lot of extra sugar). The original version are tasty like the lemon ginger or apple flavors. There is a great green food supplement from EarthRise, which is a spirulina supplement. You know how much I love greens, so I’m happy about this whole food that’s high in protein/beta carotene/antioxidants—it adds more nutrients to your diet! It is similar to the macro greens so you can switch them back and forth in your diet in order to get a variety of different minerals. Now spirulina is different in some ways. Spirulina contains ten times more beta caroten than carrots, a nice concentration of vitamin B and vegetable source amino acids. Watch out for so-called “weight loss powders.” There are several types I saw at the show which said all you have to do is put their powder in a water bottle and drink 30 minutes before a meal. Well, drinking water before you eat will already help you curb your appetite, without the powder. These powders are high in caffeine, and caffeine is an appetite suppressant, but there are lots of side affects that are not good, such as increasing your adrenal gland stress and cortisol levels in your body. When this happens, it’ll put you in a high stress state which makes your body excrete excess cortisol which causes fat accumulation in the belly area! Make sure you read the labels very carefully so you can really learn what’s in these “diet” powders before you buy them! Brendan Brazier owns Vega and they have created a really great product which contains vitamins, minerals and protein from hemp, brown rice, flax, and peas. It’s great for on the go or added to a smoothie. It’s easy and tastes good. Bran crisp bread (cracker). This is a great example of a company creating products that are high in fiber and low in refined carbs. Much like sprouted grain bread (Ezekiel bread, etc. ); these crackers are much denser in fiber and are an excellent way to replace white bread or “fake brown bread” in your diet. 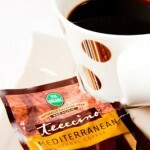 Look for new products like this one in your local health food store or health food section. Teeccino is a wonderful substitute for coffee. It’s a dark roast with a rich flavor and a hint of chocolate. It’s low in sugar, and contains barley and chicories. It’s a great option if you want to curb your coffee appetite. I know I’m going to get a lot of flack from coffee drinkers, but take my information as you will. Coffee isn’t good for you because it dehydrates and strips the body of minerals and creates and acidic environment in the body, which can contribute to osteoporosis. When you’re body is dehydrated, it cannot flush out excess toxins or fats, so you’ll hold on to more of the bad stuff! You’re also more likely to pull a muscle when you exercise if you are dehydrated. Here’s a breakdown on some berries I found: Incan berries, goose berries, and Goji berries. 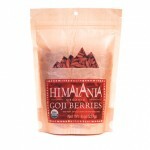 Goji berris are exotic berries from the Himalayas. They are an excellent source of antioxidants and are good replacement for blueberries or raspberries. Although organic blueberries are great, these other types of berries will definitely add variety to your smoothies and snacks. 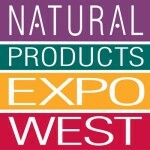 Thanks for joining me on my voyage to the Natural Products Expo! Thanks so much for your information and reviews! I have never tried the Nori Seaweed Sheets although definitely want to try them. Also definitely agree with the GG BranCrisps. My husband and I have been on a low calorie diet for about 4 years and these crispbreads have been staple to our diet. We have at least 15-20 of them day (Note: only 12 calories per slice)! Our favorite way to eat the crispbreads are with a mixture of Cinnamon and Truvia although they can be used for any meal. For example: breakfast use as toast with your eggs, lunch as a bread substitute for a sandwich, dinner as small pizzas with tomatoes and basil…etc and these are only a few of the ways we enjoy our brancrisps. GG also created another version of their Crispbread Crackers called ‘Sprinkles’ which are ground bran crips that can be used on top of your yogurts, smoothies, salads or possibly as a substitute for breadcrumbs. Thanks again for the great suggestions and look forward to reading more. Wow Bodyhacker! I just like that name. Can I use it? Lots of diversity in these little crackers. Thanks for the tips! I’m sure everyone appreciates them. Thanks for the great information! I definately want to try the bars, and see if my two year old will like them also, since it is hard to get her to eat veggies…. A little goodness snuck in with sweet. That’s how you have to transition them. Kardena, I’m not sure what you mean about added sugars in the new chocolate Larabars. Their Jocalat bars do not have any added sugar. They add cocoa powder and cocoa mass, neither of which have sugar. My understanding is that the sugar content of their bars is just from the dried fruit. There are new Larabars that contain chocolate- they are using added sugar with the chocolate not just using dates. These bars may not be on the shelves yet since they were just at the Natural Foods Expo. Some of these products are up and coming. Good point though! I like that you are a label reader! Curious if you have tried or recommend brendan braziers vega bars. I’m also someone that doesn’t often eat “protein bars” because of all the added junk thats in them…ie sugar! But I’ve found this one to be the most natural and lower in sugar then most! Oh yes I did try the. I did find them to be way more healthy than most bars. I wish they tasted better.